Synopsis: Like her favourite literary character, Jane Eyre, Jane Steele is tormented by her horrible aunt and a sadistic schoolmaster. But that’s where the similarity ends, because Jane isn’t willing to let awful people take advantage of her and those she loves. In fact, she will do anything it takes to keep them safe, even if it means committing murder, again and again. Anyone familiar with the story of Jane Eyre will have an idea of where this story is going, but it’s how the story unfolds that makes it a fun read. Jane Steele visits a side of London that isn’t experienced in Charlotte Brontë’s book. It’s dark, bleak, and full of colourful characters that open Jane’s eyes to a life outside of the prim and proper world of an English lady. This makes her far more willing and able to accept the unique circumstances she faces when she returns to her childhood home as a governess. The new owner and his staff bring a very different look and feel to the old house, and have their own secrets that threaten to bring more trouble into Jane’s life. 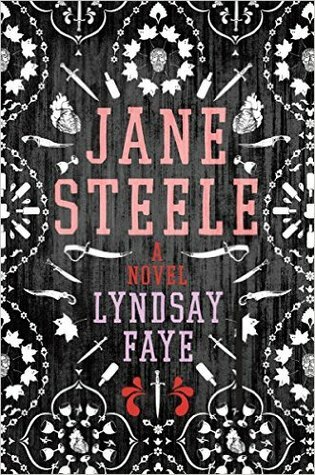 Although Jane Eyre is already considered a feminist novel, I think Jane Steele takes it to the next level by creating a truly independent protagonist. She manages to survive the mean streets of London, doing well enough that her only reason for returning to Highgate House is because she wants to find out if she can claim her inheritance. She is strong and brave, willing to fight for what is hers and to protect those she loves. Her worth isn’t defined by the men in her life, and she uses the fact women are constantly underestimated to hide in plain sight. I’m definitely curious to read more from this author, and would be thrilled to read a follow-up to this novel if she ever decided to write one. Jane Eyre might be a single book, but that doesn’t mean that Jane Steele can’t be a series. Lovely review. I loved this book and I would definitely read more if there was something further – it doesn’t feel like it though does it. I have looked at her past series which looks fascinating and I’m thinking of picking up. I doubt that she will continue with Jane’s story, but I wish she would. I’m on a historical mystery kick right now, so I’m sure I’ll read some more of her books soon. I’ve been circling her Gods of Gotham books – they look really good and I like the era. I think I will definitely give them a go.